Zucchini is in abundance at this time of year so I pulled out my MIL's recipe, got all the ingredients together and got to baking. Hubby and I enjoyed some for dessert at supper. The rest will be shared! Hmm..who would like some?? Cream butter, oil and sugar, blend in vanilla, eggs and buttermilk. Mix dry ingredients and shredded zucchini and mix in with the moist ingredients except for the nuts and choc chips. Pour into a greased 9 x 13" pan. Sprinkle with nuts and choc chips. Bake in preheated 325º oven for 45 min. Cool on rack. Serve warm with whipped cream or ice cream. It also is delicious served cold. Well technically the pie is only about one foot long. With the transparent apples ready in our region, the apple peelers are going full throttle. 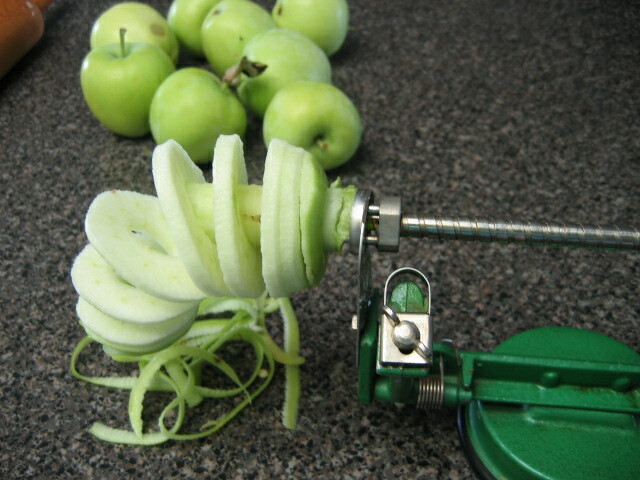 This little apple peeler has peeled many apples. After school snacks, apple sauce and of course pies, it's the handiest little tool. Flatten into a rectangular disc and put it in the refrigerator for an hour. Peel and slice enough apples to make 8 cups. Toss the apples with 1 1/2 tablespoons minit tapioca. Roll each piece of dough roughly the size of the cookie sheet. Roll the dough onto a rolling pin and transfer onto the two cookie sheets. 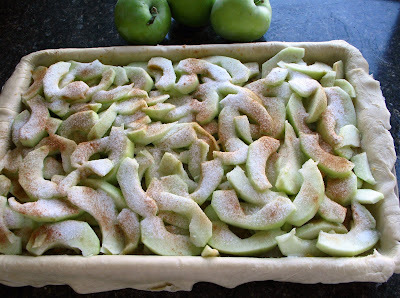 Divide the apple mixture between the two pieces of dough. Fold first one long side over and then the other and then fold the ends onto the top last. Take the two egg whites and beat them until soft peaks form. With your fingers spread the egg white over top the pies as shown. Stir together until no lumps remain and then drizzle over the pie as soon as it comes out of the oven. Let cool completely and then slice. Living healthy becomes important as we have so many choices today. I have a sister-in-law who always shares some wholesome healthy recipes. and this has become one of my staples in our home for our grandkids. "Oma, can I have some yogurt with Crumbs?" Mix all these ingredients in a large stainless steel bowl. I make sure that I chop my almonds and cashews coarsely. In fact I use any nuts, walnuts, pecans, hazelnuts etc. that will equal two cups. In a small bowl, I mix the following ingredients. I stir these ingredients and blend them together with my Brown mixer. It makes the right consistency. Then mix the wet ingredients with the dry. Stir till all the ingredients are moist. Stir every three minutes for up to 30 minutes. I prefer my granola crunchy. When cool, pour Granola into a container and freeze. Cover with a large spoonful of Granola. This has been a life saver for many a quick healthy snack. We had a family gathering and I baked three Rhubarb pies since we all have our personal favorites. Try them all and decide for your self......mine is Rhubarb Cream. 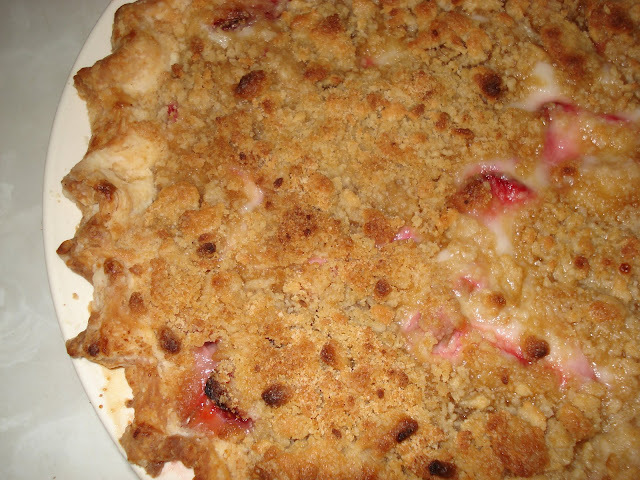 The recipe below had an even tie with Rhubarb Strawberry Streusel Pie. I wouldn't know I didn't get to taste them, sigh. This is truly a wonderful crust, I always always have success with it. Mix flour and salt, cut in the lard until there are pea sized crumbs. Pour in the ginger ale and gently combine to mix the wet and the dry ingredients together. Try not to over work the dough and have all the ingredients cold. 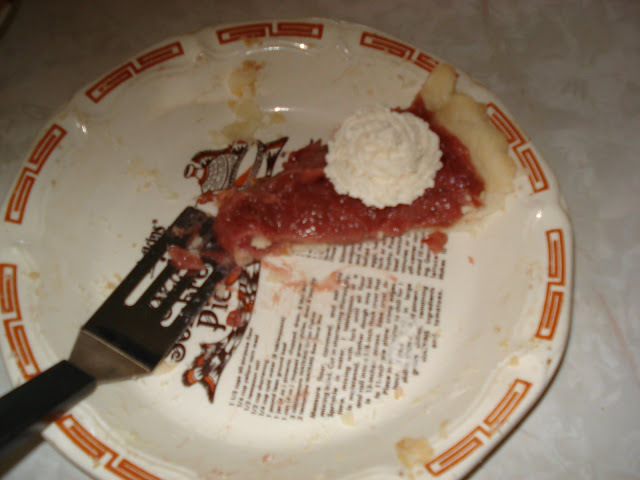 If you make a one crust pie, put it into the pie plate and chill before baking. Bake at 375 F for about 12-15 minutes or it has reached the desired color. (it helps keep it from shrinking). For a double crust pie follow the directions below. 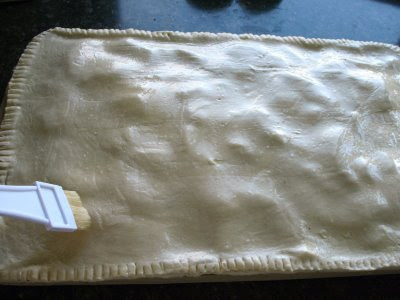 Line the bottom with pastry. Mix the sugar, flour, eggs and pour over the fruit. Dollop the top of the fruit with butter. Cover with the top layer of pastry. Bake at 425 F for 10 minutes on the bottom rack of your oven. Turn the oven down to 350 F and bake for 40 - 45 minutes. If the top of the pie is getting too brown cover with a piece of aluminum foil to prevent further browning. Hey mom can we have pie? Sure just wait til I take a pictu.........never mind. TEENAGERS! When my youngest daughter was born I received some wonderful meals and this pie was part of a fabulous dinner and is my personal favorite. Baked pie shell, filled with a Rhubarb custard. Delish! Combine rhubarb, half the sugar and cook til rhubarb is softened about 10 min. Mix remaining sugar, flour, salt, egg and milk. Add a little cooked rhubarb to mixture to temper the egg, then mix in with remaining rhubarb, cook a few minutes til thick . Cool completly and serve with whipped cream. Line a 9" pie plate with your favorite Pastry. In a seperate bowl mix the remaining ingredients and pour over the Rhubarb and Strawberries. Mix remaining ingredients and pour over the fruit. Mix the flour and sugar. Cut in the butter until you have course crumbs. Bake at 450 for 10 minutes then at 350 for 30-40 minutes. 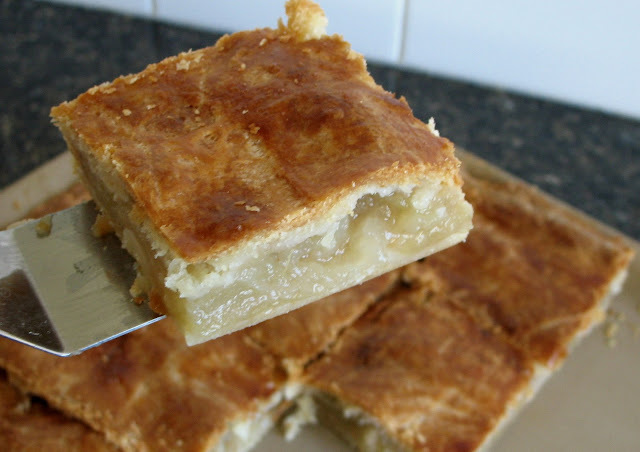 There’s nothing quite like apple pie in July! Yellow transparents are an early apple and ready for the picking, and they make a wonderful, old-fashioned apple pie. 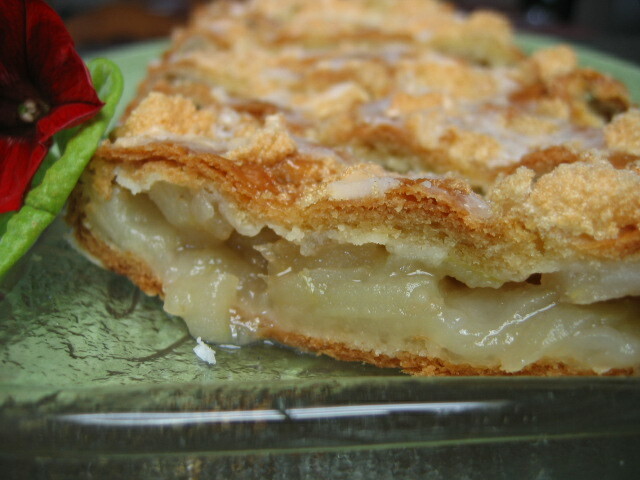 I like to make 'apple-pie-by-the-pan' to feed a crowd...or simply to freeze and take out a few pieces at a time. Cut margarine into flour and salt. Add egg yolk and milk. Roll out half the dough and place on large bar pan...about 12 x 16 inches. 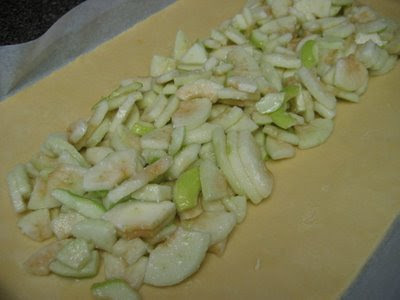 Spread apple slices evenly over bottom pastry. Sprinkle with sugar, flour, and cinnamon mixture. Roll out other half of dough and place on top…pinch edges. 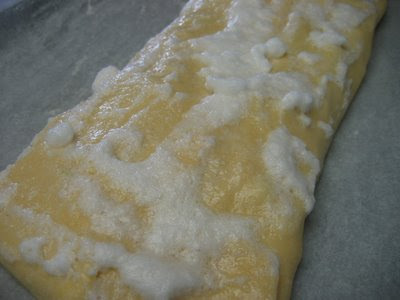 Beat egg white until foamy and spread over crust. Bake at 400 for fifteen minutes…reduce heat to 325 and bake an additional 30 minutes. These crepes often bring back memories of the couple who was teaching/mentoring us when we were in a young marrieds class. Hank and Joyce modeled true caring and hospitality to all of us and often had a large group at their house on Sundays for brunch. We learned so much from them! I remember large cookie sheets of crepes coming out of their oven and being so impressed with the ease and joy they served us with, together. It made me want to be like that. I have altered the recipe a bit, although I think I would like to try it again in the way that they made them, with a little dry white wine in the sauce. For now I will just write it out the way I’ve made them. Always good! Use leftover, turkey, roast chicken or rotisserie chicken (when it's too hot to cook). Cubes best once it's been refrigerated. The meat goes a long way. I usually serve these with stove top dressing and/or rice, steamed broccoli and a cucumber salad. Beat with whisk or electric beater. Fill ladle with 3 tablspoons of batter and pour into a small, heated (7 inch) Teflon pan, holding it slightly at an angle and then rotating to cover. Cook just below med heat. Usually no need to grease, maybe spray for first crepe. Makes about 10. Add milk, starting slowly, while stirring, and continue until smooth and bubbly. 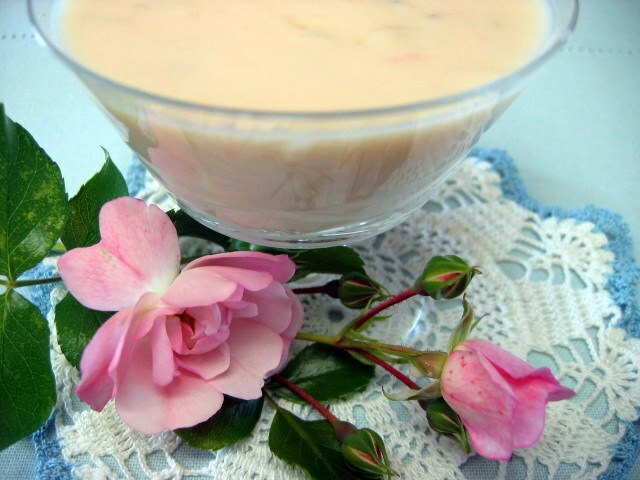 Mix 1/1/2 – 2 cups cooked, cubed chicken with cheese sauce, saving some of the sauce for topping. Spoon into crepes, roll up and lay side by side into Pyrex casserole dish. Spoon saved cheese sauce over center of crepes and bake at 350 F, 20 min. I usually cover with foil to prevent drying out. You can probably heat them for 10 min without foil. 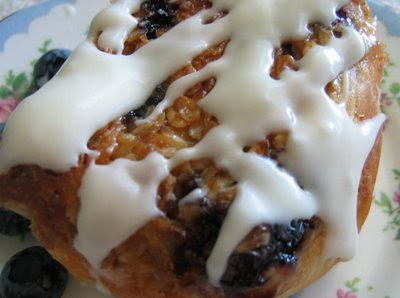 These can be made ahead of time and refrigerated before baking. I've always loved the smooth creamy taste of a baked cheesecake. I've experimented with many different methods and I've found the secret.No cracks. . . not a one. It is one of the easiest and classiest desserts to serve. Roughly cut a piece of parchment paper to fit larger than a 9 inch springform pan. Lay the parchment paper on to the bottom and put the edge around and squeeze the pan shut leaving the excess paper on the outside of the pan. I do this because it makes it really easy to transfer onto a serving plate once it is very well chilled. . Mix together the crumbs and the butter and press into the pan. I use a flat bottomed glass to make it nice and smooth and firmly pressed. Bake the crumbs in the pan for about 10 minutes or until they are a bit fragrant. Make sure that all your ingredients are room temperature. In a large mixing bowl, beat the cream cheese on low for a minute or two until it is smooth and creamy. Add the salt and the sugar and beat another minute or two until it is smooth. Never beat the cheese to death. Incorporating too much air will cause your cheesecake to rise and then fall and the .. .well you know what happened to humpty dumpty. Stop your mixer in between to scrape down the sides so that all the cream cheese and sugar is evenly mixed. Add the flour and mix until incorporated, not more than a minute. Crack the eggs into a bowl and at room temperature. Add one egg at a time. They'll naturally slip in one at a time if you don't dump your bowl to quickly. Mix the eggs in just until smooth. Add the cream and and the vanilla and lemon juice another mix for half a minute. Take your pan with the cooled crumb crust and wrap it in heavy aluminum foil. Gently pour the cheesecake batter into your pan and set it in the 500 degree oven. Set your timer for 10 minutes. At 10 minutes turn your oven to 200 degrees. Bake for another hour and 10 minutes. Don't peek. While the cheesecake is baking, stir together your sour cream, sugar and vanilla. After the hour and ten, the cake should be fairly set. Open up the oven and pour your topping on your cake smooth it out and put it back in your oven for another 10 minutes. 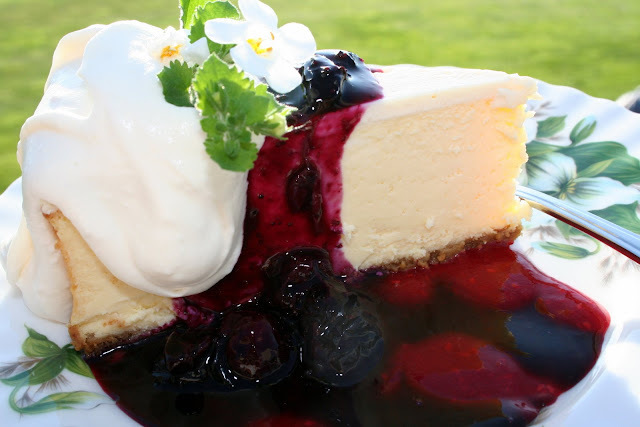 Put an instant read thermometer in the center of the cheesecake. Your aim is to have it read 150. The total baking time shouldn't be more than about an hour and a half up to an hour and forty minutes but you really need the instant read thermometer to help you with knowing when it is done. The jiggly in the center is also a good judge but it is hard to get it perfect with this test. Take the cheesecake out of the oven and let it sit in a draft free room temperature spot for a few hours and then chill it completely in the fridge. Combine all this and cover and put in the microwave for a minute, stir and cook for another minute or two until bubbly. I also made some raspberry coulis which is 2 cups of raspberries and a half cup of sugar in the blender. . Pool a little raspberry sauce on your plate, put on your cheesecake and cover with a good tablespoon or two of blueberry sauce and a dollop of whipped cream for good measure. 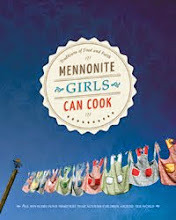 I love trying new things and I found this recipe for Cola Marinade at Foodgeeks.com. I tweaked it a bit and tossed my roast in the zip loc bag. Put your large zip loc bag inside a measuring cup, folding the edges over the cup. Add all the ingredients into the bag. Remove the bag from the measuring cup careful not to spill. Add a 4-5 pound sirloin beef roast. Seal the bag, put the bag in a bowl and put it in the refrigerator for up to 24 hours. Let the roast sit at room temperature 1 hour before putting on the grill. Tie the roast onto your rotisserie. Preheat the grill to 400 and insert the rotisserie onto the grill. Add a drip pan underneath with 1 cup of water, check to make sure the water doesn't run dry, or you will have very scorched drippings. Grill with the lid closed for 1 hour, check the temperature. You will aim to have the internal temp at 135 - 140. Remove from the heat and wrap in foil for 15 minutes. During the resting time we grilled our chopped up veggies in a grill basket. I simply toss the veggies with veggie seasoning and olive oil and stir them once in a while. They only need 10 - 15 minutes on the grill. I adapted this recipe from CD Kitchen online. Peel and slice enough peaches to fit into the bottom of the shell, they will float about a bit once you pour the custard on top but it won't affect the outcome. I used 5 peaches each one cut into eight. Combine all the ingredients in a medium sized bowl and beat until smooth. I had my food processor out so I whipped it up in there. A blender would work perfectly too. 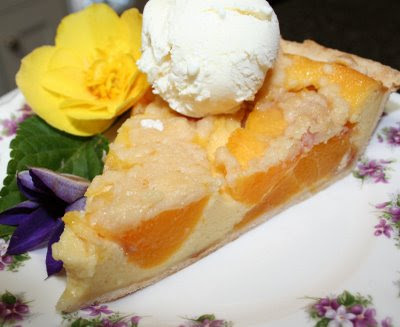 Pour the custard on top of the peaches and bake in the center of the oven for 10 minutes. Lower temperature to 375 and bake for an additonal for 30 minutes. The original recipe does not ask you to lower the temp, but I did, so you probably don't need to. After the pie has baked for 1/2 hour and the filling is somewhat set, drop the little pieces of struesel on top of the pie. Continue to bake until the streusel is golden brown, about another 15 - 25 minutes. 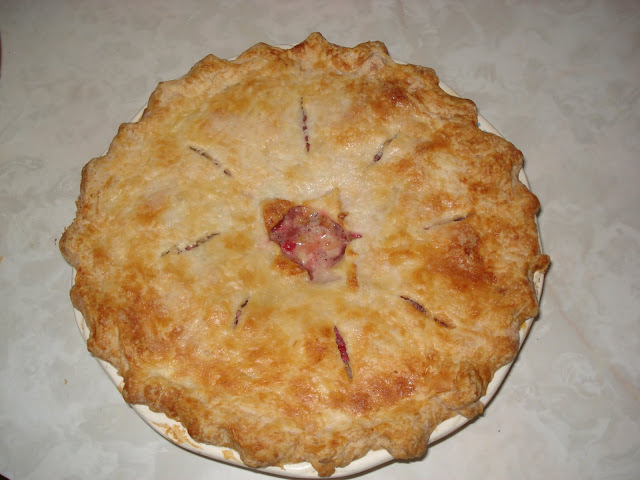 Remove the pie to a cooling rack and serve warm or completely chilled. These peppers are as tasty as they are attractive and are a great addition to your summer BBQ. My sister passed this recipe idea on to me and they've become a summer favourite at our house. Cut peppers into 3 or 4 sections along ribs so that each piece can be filled. Cut grape tomatoes in half. Place in a bowl. Chop basil leaves and mince garlic and add to tomatoes with olive oil , salt and pepper and olives. Crumble feta cheese into bowl and mix gently. Grill pepper pieces, cut side down on medium hot BBQ. When they begin to blacken around the edges, turn them over and fill each piece with some of the tomato mixture. 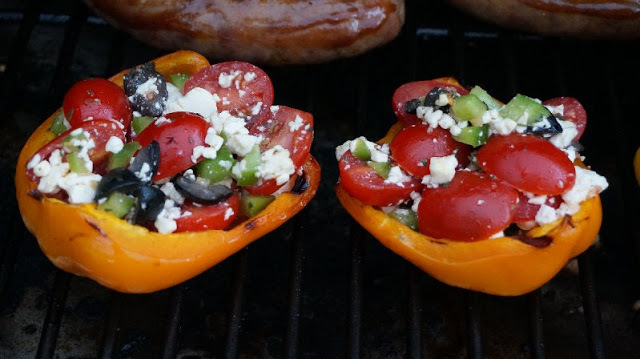 Continue to grill until tomatoes are heated through and bottom of peppers begin to blacken. I would guess that I’m not the only one, who would say that most of my favorite recipes are those that we’ve enjoyed in someone’s home. 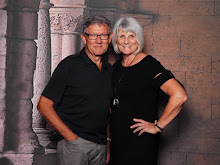 Our good friends, Harv and Bonnie love to cook together and we have been the lucky recipients of their hospitality over many years now. This is just one of the great recipes that they have shared with us. I've added the basil, so it's optional. Combine garlic, parsley, basil, salt, tomatoes and oil in jar. Place salmon on greased foil, on low heat on BBQ. Close lid and cook 10 min. Spread garlic mixture over fillet. Close top and raise temp. to medium. Cook an additional 15 - 20 min, until fish flakes easily when tested with fork. This recipe was from a friend - Heidi in Winnipeg. Cooking the chicken in the marinade keeps it exceptionally moist. Combine marinade ingredients, mixing well. Place chicken in a large ziplock bag and pour marinade over. Seal bag and marinate in fridge for no more than 3-4 hours. Place a foil pan (lwith edges) on a preheated BBQ. Place chicken pieces in pan and pour marinade over. Grill for 6-7 minutes per side, turning only once. I seldom kept fresh ginger in the house because it would spoil before I'd used it up. Then someone told me to keep it in the freezer. It is very easy to scrape the peel off the frozen gingerroot and grate it on a microplane. Grate as much as you need than pop the rest back in to the freezer. Put sugar, oil, salt and hot water in a large mixing bowl. You can also use a mixer that has a dough hook attachment or your bread machine. Add 1 cup of the flour mixed with the yeast, then the rest of the flour, 1/2 cup at a time. Add flour until dough comes away from side of bowl or easily holds together in a ball shape and is not too sticky if you handle it with floured hands. Cover bowl with wax paper and tea towel. Let rise until double, about 1/2 hour. Divide in half. Roll out on a slightly floured surface to about 12"x15” rectangle. Roll up jelly roll style, beginning at longer end, and place on greased or parchment paper lined cookie sheet. Cut diagonal slits on top. Cover with tea towel and then wax paper or plastic. Let rise about 30 - 45 minutes. Brush with mixture of 1 egg and 2 tablespoons milk, whisked with fork. Bake at 400° F for 20 minutes, or until golden. Remove to rack to cool. Instead of rolling out the dough, just divide and press onto 2 pizza pans. Bake at 400° F until light golden - barely done. About 8 -10 minutes. Spread lightly with pizza or spaghetti sauce. Sprinkle with Parmesan cheese. Cover with any cold cuts you want . . . ham, salami, pepperoni, cooked hamburger (left over sloppy joe sauce) or cooked chicken, slivered peppers, grated cheese (mozzarella, or assortment). Sprinkle with oregano and basil. Bake at 375° F, about 15 min. 1/4 cup Parmesan cheese and 1- 2 teaspoons garlic powder to the dough, as you're mixing it. Cover and let rise. Cover and rise 1/2 hour. Bake until light golden, about 25 - 30 minutes. Serve with Olive oil and balsamic vinegar. 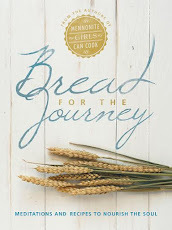 Use any kind of combination of flour and grains that you like, roll out to make long skinny loaves (baguettes) and slice at an angle. Great with Spinach dip. Maybe this is too much information, but it's there to give you ideas on what you can do and I hope you try something new and enjoy it. Roll out as for French bread (18 x 10 inch rectangle). Spread lightly with sauce. Cover with grated cheese, bacon bits, oregano and basil. Roll up jelly roll style, starting on long side. Cut into 11/2 inch slices. Place on greased or parchment paper lined cookie sheet. Cover with tea towel and plastic. Let rise about half an hour or until they look puffy. Enjoy warm or cold. Good substitute for a quick sandwich. A meal in a salad bowl. and don't feel like cooking. but I'm sure they would be even better with homemade dressings. Brown the ground beef into a frying pan, removing the excess fat with a spoon or baster. Add the taco seasoning, stir in well and fry a few minutes longer. Seed the tomatoes and chop. Cut the cheeses into a 1/4" dice. You should have at least 1 cup combined. Chop up the peppers - again about 1 cup chopped. Chop the zucchini or cucumber into a 1/4" dice. Tear the lettuce into a large bowl. Add the ground beef, tomatoes, cheese, peppers, zucchini and corn chips. Toss with enough dressing to moisten. Note: chicken breasts grilled on the BBQ give this salad its special flavour. Fruit pizza is a perfect summer time dessert. It has a cookie base that is covered with a cream cheese spread, and then topped with seasonal fresh fruit and a glaze. The cookie base recipe is enough for 2 pizza pans. If you are only making one this dough freezes well. Begin by measuring milk and vinegar into a glass measuring cup. Stir and allow this mixture to sour. Cream together shortening and sugars. Add egg, vanilla poppy seeds and lemon rind. Mix well. Stir milk mixture and add it along with remaining ingredients. Mix well. Spread cookie dough onto a lightly greased pizza pan. Bake in 350ºF oven for 8-10 minutes. The base will be golden brown. Cool. Place ingredients in a bowl and cream together well. Choose fruit of choice and arrange it on top of the cream cheese spread. I use kiwi, strawberries, raspberries, peaches, apricots and plums. Shake this mixture together well in a jar and then place in a small pot or in microwave. Cook until mixture is bubbly and cornstarch has dissolved. Allow to almost cool and then pour over fruit. I use a silicone brush to spread the glaze as it helps to cover all the fruit and get into all the little spaces between the fruit. Place fruit pizza in the refrigerator for about an hour. Serve with a dollop of whipped cream. Tip: This dessert is best the day it is made. 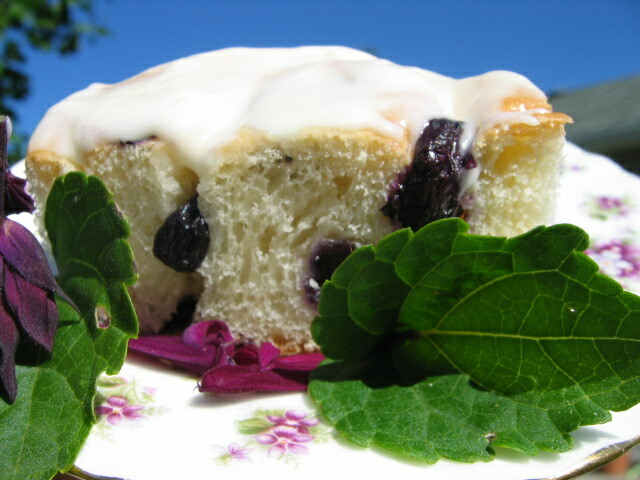 This recipe is posted for Vange, who reminded of this recipe recently. Over the years I’ve changed it up a bit, sometimes making it more of a Greek Pasta Salad by adding feta cheese and using Greek Dressing, or mixing it with a sundried tomato dressing. Cook pasta according to instructions on package. Do not over-cook. Cool. Mix dressing ingredients and then mix with pasta and vegetables. Cream puffs are a favorite dessert in our family. We like them served with whipped cream and peaches or strawberries or with a vanilla pudding and whipped cream and chocolate drizzled on top. This recipe can be doubled and you may want to because they disappear really fast! In a medium sized saucepan bring water and butter to boil. Stir in flour, sugar and salt, stirring constantly until mixture forms into a ball. Remove from heat. Beat in eggs one at a time until mixture is smooth. Scoop mixture on baking sheet at least 2" apart. Bake in a 400º oven for 15 minutes, then lower temperature to 350º for 30 minutes. Turn oven off and with oven door slightly ajar allow puffs to dry out for 10 to 15 minutes. Remove from oven. Best served fresh. They can be frozen and reheated. Chicken Stew is a nice comfort meal served with fresh crusty bread. Heat the oil in a heavy 5-1/2 quart saucepan over medium heat. Add the celery, carrot, and onion. Saute the vegetables until the onion is translucent, about 5 minutes. Stir in the tomatoes with their juices, chicken broth, basil, tomato paste, bay leaf, thyme. Add the chicken breasts; press to submerge. Bring the cooking liquid to simmer. Reduce the heat to medium-low and simmer gently uncovered until the chicken is almost cooked through, turning the chicken breasts over and stirring the mixture occasionally, about 25 minutes. Using tongs, transfer the chicken breasts to a work surface and cool for 5 minutes. Add the kidney beans to the pot and simmer until the liquid has reduced into stew consistency, about 10 minutes. Discard the skin and bones from the chicken. Shred or cut the chicken into bite size pieces. Return the chicken meat to the stew. Bring the stew just to a simmer. Here are some variations you can consider: Double the recipe. Use a whole chicken instead of just breasts. Let the dark meat cook longer than the breasts. Use chopped tomatoes with jalapeno and chopped tomatoes with sweet onions and garlic for extra flavor and spice. Use both kidney beans and a can of garbanzo beans (chick peas), drained and rinsed. If you don't have fresh basil use a teaspoon of dried. If your family enjoys mushrooms add some fresh mushrooms, too. If the guys in your life are wondering "where's the beef? "...here it is! 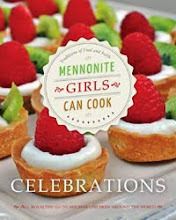 I was at a women's conference some twenty years ago...and attended a cooking workshop. The facilitator left me with some wonderful recipes that I've made my own since that time. 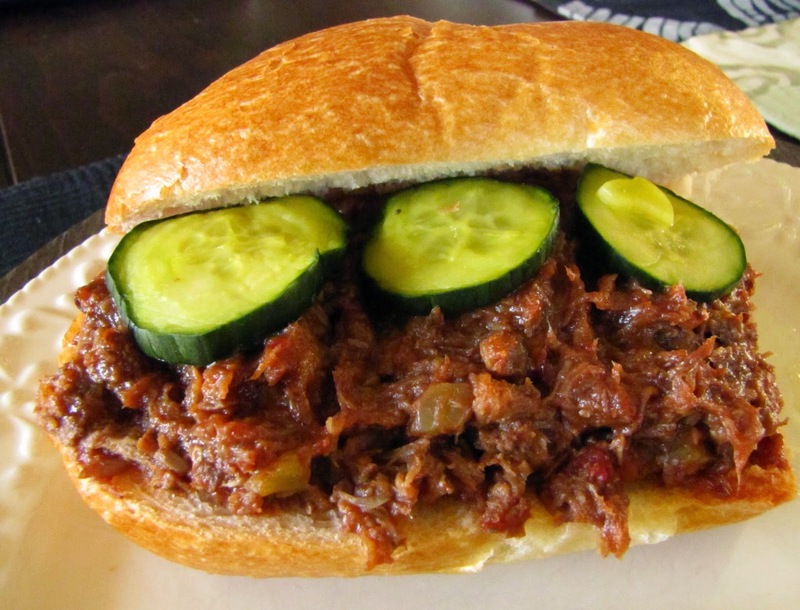 One of our family favorites is the BBQ'd Beef. I have brought it to potlucks...camping trips...and it was our dinner at the beach a few nights ago. Cook in slow cooker overnight (about 10 hours) on low. 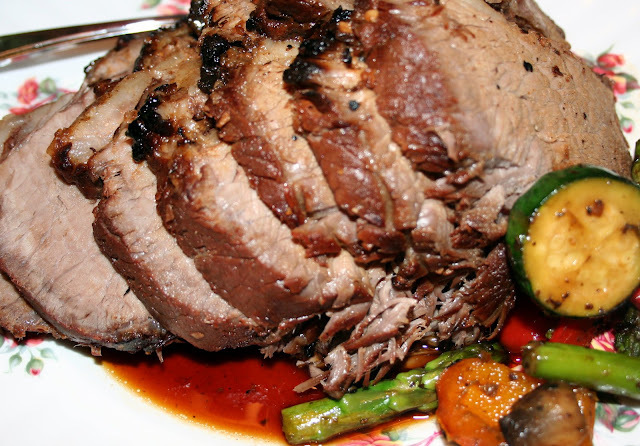 Drain juices and shred the cooked beef with two forks. Sauté onion and celery until tender. Add remaining sauce ingredients and heat through. 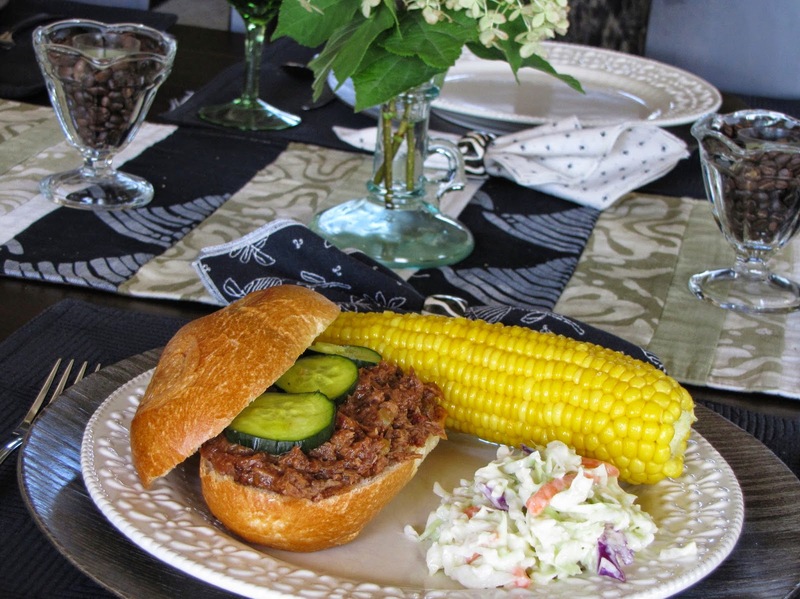 Serve on submarine or beef-dip buns. The original recipe calls for five steaks...I use any beef I have handy. I often cut up large roasts...and if my crock-pot is chock-full, I make slightly more of the sauce. In a saucepan bring gooseberries and water to a boil. Simmer 5 - 6 minutes. Add slowly to the gooseberry mixture, alternating with the remaining milk and cream. Stir constantly. Remove from heat. Cool. Maybe served warm or cold. A Canadian version would be to add an egg to the thickening after the berries have been boiled to make it more custard like. Add a little hot fruit to the flour/sugar/cream and/egg mixture. Stir well. Then return egg mixture to the gooseberries. Stir constantly. Boil 2 minutes, 1 tsp. vanilla is optional. Cool, Enjoy!